Why yes, since you ask, that is a glass of Tynt Meadow dubbel (a branded Tynt Meadow glass, in fact, although that part isn’t obvious). Bottle and glass are both rather nicely designed; note in particular the die-cut bottom edge of the label, showing the skyline in (presumably) the eponymous meadow. The projection to the left of centre is the abbey of Mount St Bernard, which I think is also what the logo on the glass schematically represents. Mount St Bernard? Cistercian monastery in Leicestershire. Not ancient, for obvious reasons, but pretty well-established; it was founded in 1835 by a group of monks who had left France following the post-Revolutionary suppression of monasteries there. Cistercian monks have been there ever since (it’s now the only Cistercian monastery in Britain) and they’ve recently started brewing beer. I say Cistercian; you could also call the order Bernardine, or indeed Trappist. YES IT’S A TRAPPIST BEER! 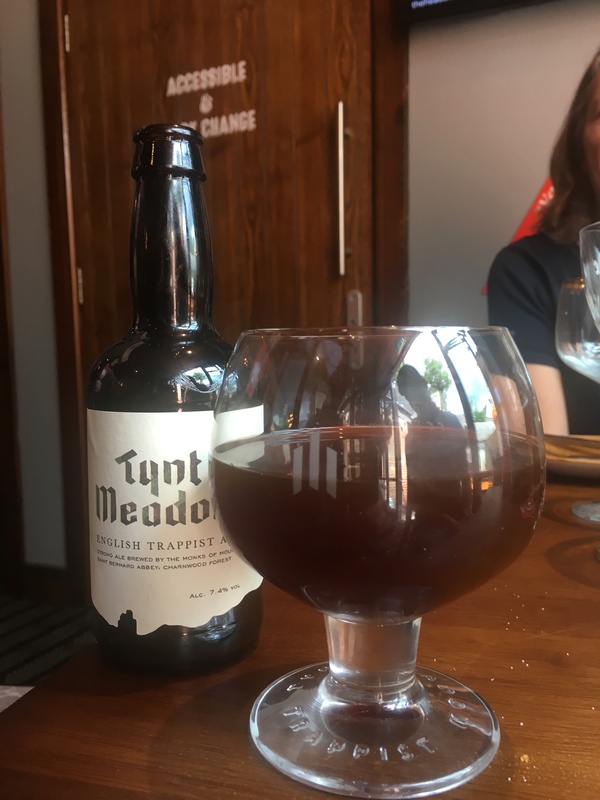 TRAPPIST BEER IN ENGLAND!! ENGLISH TRAPPIST BEER!!! When I spotted this beer in the fridge at the Head of Steam in Durham, I was initially going to leave it – I quite liked the idea of being able to say I’d spotted it, and putting off actually buying it for another time. (Also, it’s brand new and wasn’t listed in the beer menu, and I hate buying things without knowing what they cost.) But curiosity overcame me in the end. Taste, though? Really nice; more importantly, really interesting. It has a lot of the caramel-backed oomph of a dubbel like Westmalle, but more bitterness and, I think, more complexity. This may be autosuggestion, but to both me and my companion it tasted ‘English’; there’s something of the way that a dark old ale develops into herby and medicinal territory, as well as a bit of stouty roastiness on the finish. This isn’t an imitation of any other beer; it’s a distinctive take on the Trappist dubbel sub-(sub-? )style, from what looks like being a really interesting brewery. I’m going to have to get hold of some bottles to drink at home, though, both for ageing purposes and just to be able to drink it a bit below room temperature rather than fridge-cold – chilling doesn’t do this style of beer any favours. Didsbury? beer descriptions … [that] seemed to have been downloaded from somewhere or other into a fixed-format template, with the result that almost all of them cut off with a string of dots; bar staff who, frankly, didn’t know their beer; the same ‘chain’ food menu as (e.g.) the Liverpool HoS; generic glassware with just a couple of ‘special’ glasses. Durham? Huge, properly curated beer menu; friendly, obliging bar staff who really knew their beer, Belgian beer in particular; the right glass for the right beer, without fail (something you hardly ever see in this country, even in self-styled ‘Belgian’ bars); and a short but individual food menu. Well, now that’s finished; you’ll never see the Durham HoS (as it was). The powers that be at Cameron’s have obviously brought Durham into line with the rest of the chain: same food menu, same “guy on the Internet says” beer menu, same interchangeable bartenders with good people skills but a cavalier approach to glassware. (For our first round we ordered an Achel and a Spencer, which came with glasses branded for Duvel and La Trappe respectively; I wasn’t sure the Achel was going to benefit from the Duvel ‘thistle’ glass and got it replaced with a ‘chalice’ glass – which was branded Westmalle.) On the plus side, the beer range is still superb – and, as you can see, my Tynt Meadow did come with the right glass, as indeed did my companion’s Straffe Hendrik Tripel. It’s certainly not the first time I’ve had a dubbel and a tripel in one visit to the Head of Steam, and probably not the first time I’ve had two Trappist beers. It is the first time I’ve had two Trappist beers from two different breweries outside Belgium – let alone from two different breweries in the English-speaking world. (As for the Spencer, it was fine, but not very special.) But then, that wasn’t possible before 2018 – in fact, it wasn’t possible before the 9th of July 2018, ten days ago. Yes, it’s Oh Good Ale, your source for breaking news in the world of beer! NB other sources are available. Seriously.